4:29 UFT President Michael Mulgrew asks for a delay to allow more people to enter. Asks new delegates to stand up. Many do and are applauded. Mulgrew thanks them for taking on this role and getting involved. Says that’s why we are strong. Workers under attack, people don’t believe we should have voice, process, or collective bargaining rights. Mulgrew starts presentation about new contract. Says all registered delegates now have entire MOA in email. Thanks attorney Adam Ross for getting it done quickly. Says union changed way it negotiated. Trained people. Many unions no longer do negotiations and use law firms. UFT trained many people. Did not use single lawyer from outside, not done since 1962. We have 400 member negotiating committee. Negotiated across summer. Members went face to face with DOE. Told truth to their lies. Decisions made by committee drove all we did. Had to make tough decisions, e.g. class size. Years ago UFT gave up raise to lower class size limits. Committee voted against doing that and decided to give more emphasis to rights we had. DOE likes to mess around and doesn’t clear up Sept. until March or April. We will debate here, but entire committee recognized that paraprofessionals needed things achieved. First they are lowest paid workers. % increase therefore didn’t mean much to them. Also they had very little due process. In last years of Bloomberg they used that as intimidation tool. Suspended without pay for yelling, would be without pay for years. More and more frequent. Thought new admin would stop but was accelerated by Bloomberg era lawyers. Sorry font is so small but you may read MOA. Calls Tom Murphy, CL of retirees. Murphy—We want to say while elected retiree delegates have right to vote on whatever comes before this body, we want in service folks to speak and vote, since it doesn’t directly affect us. Mulgrew—Usually we would talk about how this DA works at first meeting, but we are deciding not to approve or not, but whether to send it to membership. Retirees inside of this body do have the right to debate and vote, though CL asks they do not. Sent out surveys last year. Collected results. Used them as priorities. Goal was to empower people at the workplace. Bloomberg was like fighting in the streets, but this time we wanted day to day work to be better environment. Working conditions and collaboration were priorities. We hate when reformers tell us what to do. Always wrong anyway. Maybe admin needs feedback. Compensation. 2%, 2.5, 3 Based on DC37, wanted to elongate and add value. There are longevity boosts. 1200 paras 500 all with salary lower than 100K, and others effective February. Lump sum remains in place, not part of negotiation. Based on new process for paperwork complaints. At first it didn’t move, We boosted it up. Formed aggressive committee at central. Were largely resolved quickly. CL can now bring these issues and principal has five days to remedy. If they do not, it goes to superintendent, and district rep. None came to me because they all got dealt with. Every school has to organize and have a committee to use this tool. We are extremely proud of this. Principals probably calling saying they hate this. Safety—always top three issues. Went from zero tolerance to kid throws a chair, let’s talk about feelings. We agree with neither. Principals were told not to suspend. We decided to boost process. We needed change in contract. DOE doesn’t want CL to see OORS reports. Now they can. Will be more deans, up to 3 for 1500 with no SBO. CL now gets all of safety plan. Will be new standards, based on state law, chancellor’s regs and our contract. Chancellor’s regs require real student removal process in every school. SAVE room is in NY State Law. Now will be covered. Faster class size process. Now average for remedy is 4-8 months. That is absurd. People get class sizes remedied in March. Teachers say leave kid by then. We understand lower class sizes lead to better outcomes. Had to change system. Principal has ten days to fix, then goes to supe who has another ten days, then it goes to central committee until all are remedied or going into arbitration. We believe 90% will be remedied early, leaving us opportunity to use arbitration days. Now we have to choose and prioritize. We believe they force ridiculous cases on purpose so we can lose days. Will now be six class size grievances a day. We will save many days. Before, arbitrator had to accept ridiculous city proposals, now arbitrator will tell DOE what they may do. This is major game changer. In the end, our members may not want to get involved. Our harassment language in contract allowed us to go to arbitration, but arbitrator was bound that decision was just recommendation. Worked well for decades. No one thought that when arbitrator deemed harassment, that employer would do nothing. We presented so much evidence we embarrassed and shamed UFT. We have retaliation and harassment language that is much stronger. Now, whatever arbitrator rules, goes. Principal can get letter in file. Paras—due process rights, Personnel file rights, parity with teacher grievance, no longer taken off payroll because principal says there is allegation against you. Now that can only happen for same reasons as teachers. Can only be held off for 60 days without arbitration. Days of abusing and intimidating paras are over. Prose plus—City said with new chancellor, they loved Prose. Said there was myth they didn’t like it. Mulgrew said he’d heard it, and previous chancellor didn’t like it. Said they wanted to send statement they valued it. They came up with idea, but Mulgrew wanted something different. Prose schools more than two years can apply and take votes of confidence or no confidence—important when new principals come in. We never know what they’ll do. If they’re uncooperative they have option to leave. City wants to try remote teaching pilot for AP for all. Many not good at this. DeVos invested. We will try as pilot. Class size lower than regular groups. Want to see what happens. Should be under control of teachers. If it works, we might enhance. New teacher leader positions. Always like to expand where members can do work other than instruction. Would hope people who do this would be at top of list to run schools, having proven they can work and collaborate with others. Evaluation—DOE let this go to last. Resolved 2:30 AM Wednesday morning. We tried to see who liked which part and go to them. DOE went from 6 to 4, said they wouldn’t move any more. Became contentious, we didn’t understand because there was only a minimum, no maximum. Last contract, priority was retro pay, this time was evaluation. City and mayor and chancellor wanted Bronx plan. DOE did not. We said we can’t move on Bronx plan unless eval goes where we need it. Finally that worked. They wanted good scores on domain 3 to have two. We envisioned bad results, and that this would be all anyone worried about. HE and E 2X is 2.. Prob and D 4. I 5. Over 90% of membership now falls into 2. You said you wanted this. Thanks committee. We also got a joint training at every worksite in beginning of year. DOE opposed. Odd because this is good management practice. We now have observation windows and cycles. Over 80% have been done in April and May. How does that help? At end new Deputy Chancellor agreed eval is broken, done as compliance exercise, people need to feel safe, and feel good about observations. We appreciate she will try. Everyone is going to be retrained. Bronx collaborative schools—majority in Bronx but not all. Mayor wanted to make statement that Bronx faced challenges. Mayor wanted to face this. Wanted to take on most challenging situation. Reformers never want to touch it, wanted to see if he could do something before leaving office. Gives him great credit for doing this. Will be set of criteria, collaboratively designed. Not just for “struggling” schools. After schools are chosen, they will need CL and principal’s approval. Will not waste time on schools that are not collaborative. Decision making must be by consensus, not caveat. Differential only one tool, may be subject area or title. Can be used by all UFT members. May be need for math teachers, or to retain math teachers. Is a pilot, sunsets with this agreement. If we fail, you can imagine what Betsy DeVos and reformers will say. But they would never go near this. MA plus 30 most used differential. More options for lower cost credits. Joint UFT/ DOE control on selecting and approving. Want education schools to teach things that mirror what we actually do. Piaget’s theories are not altogether useful. Let’s approve things that are practical, like CTLE. Make them A plus credits. DOE will give at least 3 CTLE during work day. These will not be A plus, though. Pre-employment screening—DOE does not need UFT agreement for this. They said this would be like fingerprinting. New teachers are mandated already to do two days of prep in August. DOE can require them to do it outside of work day. DOE wanted four days of training. Agreed if they used mandated days during school year. Already lost 100 teachers this year. People don’t understand the stress. Mulgrew wants motion to extend meeting. Motion proposed—we accept MOA for general membership for vote. Mulgrew—Wants members to have facts in hands, not interpretation. That’s why MOA went out to entire membership. CL—Against motion to vote, would rather do questions first. Passes. Will be question period. One question each. Mulgrew extends from 10 to 15 with permission from body. Q—reps members who get s and u. How many observations for us? Q—Spoke about para due process. What about paras now suspended? A—Continuing conversations about speeding this up. City also wants to speed up provisions. We are early, so it’s possible. Q—Bronx plan sounds great, but if I go to school I don’t like where it doesn’t work can I go back? A—You can still leave, but you have one year right of return. A—directly tied to license and title. Q—What about space? Many classrooms not conducive to learning. A—We know schools don’t have space, and others have it but leaders don’t know how to use. We have schools over 200%, but some with available space. Now they must use it. Supe and DR will enforce. Q—What did we have to give up to get contract? A—Shame we have to enforce getting children out of bad situations but we will. Q—What is UFT doing for special ed teachers overworked with meetings, IEP? A—Workload now covered under new process. Bring to principal or CL. Q—Why not close gaps for physical therapists? A—DOE and OLR said that title not something they wanted to give more, except for raises. We created longevity for that chapter. Just because we demand doesn’t mean they say yes. Said they’re over other agency PT and OT. Q—Staff delighted by evaluation. Can they choose formal? A—E and HE all informal. Maybe teacher can request. We assume serious principals would adhere, if not would be evidence principal not doing job. Q—Who is labor management committee? A—CL decides. DOE wanted principal to choose UFT members. Recommends process. Q—Is there anything about freedom of teacher to use chosen methodology? A—I would tie that to PD and curriculum. We don’t believe in scripted approach. Evidence says it doesn’t produce good results. Mulgrew—motion to recommend to membership for vote. Open to discussion and debate. Q—What does Bronx thing have to do with Renewal schools? Janella Hinds—Asks for support to move forward. Contract negotiated by membership who sat across from DOE. 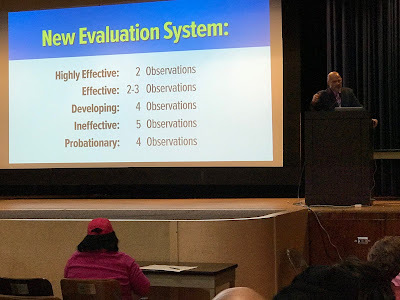 Said what we want to see I evaluation system. We have better system because of work of union. Committee was willing to see change, but wanted protections. Hopes members will support this contract. Erica Brown, para, supports contract. Wants to send to membership. Due process big opportunity. Asks for support. Scott McMillan—CL—Opposes motion—meeting called suddenly. Not enough time to read 63 pages. Told these things are good, but does not fully understand. Needs time. Concerns about screenings. Not major progress on class size, erosion of rights for new teachers. Shouldn’t rush in and take word. When raise does not keep up with inflation it is not a raise. Skyrocketing housing in NYC. Bigger numbers will be worth less. Not ready. Mulgrew—Health care has nothing to do with this agreement. We are only saying this should go to membership. They will have plenty of time to read. We rushed MOA out for that reason. Adam Marcus—Wanted to vote against. Hard to go to membership without understanding pattern bargaining. NYSUT says looming teacher shortage. Why can’t we go beyond pattern for this. Health benefits not mentioned. Anything else we give up? Mulgrew—Health care negotiated with all unions. Done six months ago. MLC thought something bad could happen with health care because of DC. We wanted to lock in a deal. No additional copays, but made a change for all unions. We tried to get plan in better place. Was proactive approach. Has been out for six months. Was smart thing to lock down our health care with no significant cost ships to union membership. Others pay 3200 out of pocket. We are only workers who can get plans with no premiums attached. If UFT members get cancer they can go to Memorial Sloan Kettering—this is with HIP, also Hospital of Special Surgery. Go read it before you tie it to this contract. Pattern bargaining simple. State gets 2 per year for five years. If we go to arbitration, our money would be tied to DC37. Moving months got extra quarter. DC37 did what was best for them. Steven Goldman—Thanks union and committee for moving forward quickly. Might not have enough info. Afraid good is enemy of best. Is there plan to renegotiate? Mulgrew—If contract not ratified, city would negotiate with other unions first. Would still continue to insist on pattern. Union has tried to break pattern for 30 years, unsuccessfully. We would go some time before city would come back to table. Exec Board, negotiation committee would not be here if we didn’t believe in it. Para delegate—Opposes going to membership until paras get same longevity raises. Mulgrew—Other side must also agree. I believe every UFT member deserves 10% each year. We can go for it and we can wait 30 years. Contract well over 2 billion dollars. Committee voted to make paras a priority. If you don’t feel its fulfilled, you have a vote. Not clear we would get those things. Motion to send to membership passes overwhelmingly.